Ah, the first of our "these are a few of our favorite things" lists! How fun. I've been considering why it is that I like games so much. And it's not solely because they're fun. I went to Trevelyn to ask him about it. "I'm writing a post about games, Bud. You like that we play games so much, don't you?" "What is it that you like about it? About playing games." "Ah. You mean, you like that it engages your brain and you have to think about something in a different sort of way than usual." Mmhmm. That makes as good of sense as anything, I'd say! Games had always seemed like a good way to engage my children in mental play. And then I read A Mathematician's Lament by Paul Lockhart. And I watched John Bennet at a California Homeschooler's conference. And I saw two mathematician's who believe that mathematics should be about excited logic and thinking, not dreadful, boring -useless- formulas. Soon after that I was checking out Game Awards... and reading reviews of looooots of different games. And soon thereafter we were spilling out of our shelves. I should say that game playing in our house is different than it might be in others. I read a review of Quarto a couple of weeks ago, and the reviewer said something like "I don't like this copy! It seems cheap compared to the one I saw years ago... there is no felt on the bottom of the pieces... someone could hand you a piece upside down to cheat, and you wouldn't know!" So when we play, we play more like it's open-ended. When we play the Amazing Mammoth Hunt (world geography), we play until we're getting tired -it's a long game- and then we say "eight more turns for each of us" or something like that. When we play Apples to Apples, we don't stop at six or whatever it's s'posed to be, we play the same way, "three more rounds!". In Checkers (Draughts) there are lots of "You sure you wanna do that? Look here." And "Woh. Look carefully. You could do a triple! ", if they seem not to see it. If they seem stuck, like they're trapped, "Remember that I can't move this one backwards, yet, so it's safe." The point is, after all, to have them feel (and Be) competent and strong in their processes and intelligence, not to bully or shame them. A couple of these are games we've made up, and a few others are handmade versions of games that inspired us. I am tempted to mark our favorites, but really all of them have been a favorite at one time or another, so I'll refrain. :) Just keep in mind that if we didn't like the game, it wouldn't be in our list. 'Young' means Maddie (age 6) can play, and has been playing for quite a while, 'Mid' means Trev (age 10) plays, 'Adult' means people with no children might have it in their house. The links will be either to a page of ours showing how we made it, what it is, or to our Amazon bookstore (for my ease, as they're all in there, and I don't have to search out each one individually.) If there is no link to the game then it's something that can be found in just about any store. For the fancy games (like Quoridor), check your local luxury (high-end, educational) toy shoppe first to see if they carry it and have it for a better price before you buy it on Amazon. I've bought a couple of games locally for cheaper. Lastly, very common games (Battleship, Scrabble, Yahtzee) are not mentioned in our list, even though we own them, mostly because we we don't enjoy them as much as these others. These listed are in our 'regular play' rotation. None of these games are in more than one category. Tangrams (handmade tans, book purchased. Young/Mid/Adult, however many players you have tans for, however long you'd like to play) Description: Fun and smart seven piece puzzles. Blokus (Young/Mid/Adult, 2-4 players, mid length) Description: Laying down your block pieces successfully. Rumis (Young/Mid/Adult, 2-4 players, mid length) Description: Fitting your pieces into the tower. Peaceful, slow, deliberate game. BaffleBlox (Young/Mid/Adult, 1-4 players, however long you'd like to solve puzzles) Description: Fitting blocks into particular patterns. A definite thinking game. Katamino (Young/Mid/Adult, 1-2 players, short length) Description: For two players, a race to fill in your square; for one player there are many tough challenges of piece placement. Geo-dice Game (Young/Mid and Me!, 2-? players, mid length) Description: This was inspired by another game, but this version we made up. You have to choose whether to use large pieces or small pieces to win the race to fill up your card. Mighty Mind (Young, one player, short-mid length) A variation of tangrams. Exago (Maddie is just starting to get this one, so.. Young-ish/Mid/Adult, 2-4 players, short-mid length) Description: Trying to get four or five in a row, depending on 2-4 players. Pixel ( Young-ish/Mid/Adult, 2-4 players, short-mid length) Description: a challenging four-in-a-row game, you can only place your piece at the corresponding point of the two sliders. Pentago (Young/Mid/Adult, 2 players, short-mid length) Description: I love this game! It's a five-in-a row game, the four sections pull out to turn, making you have to concentrate and think carefully about what you're doing. One marble is placed, and one rotation (of any of the four sections) per play. Rat-a-Tat Cat (Young/Mid and Me!, 2-6? players, short-mid length) Description: Four cards laid face down, trying to get the lowest score. Quiddler (Mid/Adult, 2-10? players, long, but can be easily stopped earlier.) Description: Making words with letter cards. Lost Cities (Mid/Adult, two players, mid-long length) Description: An adventurous card game. Othello (Mid/Adult, 2 players, mid length) Description: You attempt to 'win' pieces by trapping them between two of your pieces, then flipping them over to your color. Subtrax (Young-ish/Mid/Adult, one player, as long as you like) Description: This is like the classical triangle "IQ game", but with different puzzles. You aim to get it down to one peg. Mastermind (Mid/Adult, two players, short-mid length) Description: A sort of fun, deductive reasoning game. Quarto (Young/Mid/Adult, two players, short length) Description: A four of a kind game, making rows of one common feature. More interesting to play offensively. Quoridor (Young/Mid/Adult, 2-4 players, short-mid length) Description: A 'race to the opposite side' game - getting their before your opponent. Each move you can either place a barricading piece, or move your game piece. Hex (handmade. Mid/Adult, two players, short-mid length) Description: A 'get to the other side' game. Offensive play is the same as defensive play. Nim (Young/Mid/Adult, two players, very short length) Description: Played on paper, you draw a box with a grid, each player takes turns crossing out one or two (directly connected) squares. The person to cross off the final box wins. Forbidden Island (Young-ish/Mid/Adult, 2-4 players, mid length) Description: A family cooperative card-style game. Sprouts Young/Mid/Adult, two players, very short length) Description: A pencil and paper game, invented by a mathematician. The Amazing Mammoth Hunt (Mid, 2-6? players, long length, but easily stopped earlier) Description: World geography. If you guess the right spot, you get the little tile. The Scrambled States of America (Mid, 2-4 players, mid length) Description: States and Capitals. You don't need to know them to play well. Professor Noggin's History of the United States (Mid, 2-6? players, mid length. Long if you have lots of cool discussions. :D) Description: U.S. History facts. SomeBody (Young/Mid, 2-4 players, can be investigated and played with alone, short/mid/long length) Description: Anatomy placement game. Lewis and Clark Exploration Card Game (Mid, 2-6? players, mid length) Description: A 'gin rummy' sort of card game with places and animals of the Lewis and Clark expedition. Totally Tut (Mid, 2-4 players, short-mid length, depending upon how many rounds you play) Description: A favorite of Trevelyn's, it's a math equations build-it game, using addition, subtraction, multiplication and division. Sort of an intro to algebra. The Allowance Game (Young/Mid, 2-4 players, mid length) Description: Coin identification, monetary addition and subtraction. Math Noodlers Grades 2-3 (Youngish/Mid, 2-4 players, mid-long length) Description: A souped-up practice of basic mathematics skills There is also a 4-5 Grade version of the game. Big Brain Academy Board Game (Mid, from 2 players to groups of teams, however long you'd like to play) Description: Many different kinds of mathematical, thinking practices in this game. One of Trev's and my favorites to play. Math Animals (Young/Mid 2-4 players, up to x amount of points, your call.) Description: Can play addition, subtraction, multiplication, or division. Each player can choose his own preference. Fraction Whirl (Mid, 2 players, short length) Description: A fast-paced identifying fractions game. Very simple, but enjoyable. Earthopoly (Mid/Adult, 2-6 players, long length) Description: An eco-Monopoly game. Go Diego Go 123 Game (Very Young, 2-4 players, short length) Description: Maddie has always liked this very simple counting animals game. Fractions Game Games we've made up. Mystery Garden (Very Young/Young/Mid, up to however many players, short-mid length per game, multiple games) Description: A sort of I Spy, 20 Questions game. Guess Who? (Young/Mid, 2 players, pretty short length) Description: A "check this off" sort of 20 questions game. Cadoo (Young -with help reading-/Mid, 2-4 players, mid-long length) Description: Race to find things, draw things, sculpt things, or act things out. Very fun! Qwirkle (Young-ish/Mid/Adult, 2-6? players, long length) Description: Lay tiles in rows according to patterns. Finish a row with one of each for extra points. Set Cubed (Young-ish/Mid/Adult, 2-4 players, mid-long length) Description: set cubes into patterns of same and different. It gets complicated! Sudoku (Mid/Adult, one player, long length) Description: Lay tiles in arrangements of non-repeating numbers. A great thinking game for one player. Puzzle difficulties vary. UpWords (Young-ish/Mid/Adult, 2-4 players, mid-long length) Description: A Scrabble-like game that builds up. Apples to Apples (Young -with help reading/Mid/Adult, 2-12 players, mid-long length) Description: A fantastic and fun vocabulary and debating game. Apples to Apples Jr. (Young -with help reading/Mid, 2-12 players, mid-long length.) Description: A fun version of the adult game, but with more kid-friendly content. Duck Duck Goose (Young, 2-4 players, short-mid length) Description: Filling up your nest before anyone else. Super fun for very young and young. Look for it locally. Twister (Young/Mid/Adult?, 2-100? :) players, short-mid length) Description: Stretching and falling bodies everywhere. Operation (Young/Mid, 2-4 players, short-mid length) Description: Remove tongue-in-cheek pieces of the body for points. Pirates' Gold (Young/Mid, 2-4 players, mid length) Description: A simple sailing the seas pirate game. Stixx (Very Young/Young/Mid/Adult, 2-6 players, short/mid length) Description: Collect your colored stixx before others get theirs or yours. Cootie (Young, 2-4 players, short-mid length) Description: Make your bug fancy and complete before others complete theirs. Ned's Head (Young, 2-4 players, very short length, but as many rounds as you like) Description: Draw a card, then race to find your object -by touch- inside Ned's Head before others find theirs. If anyone has any questions about any of these games, or about current favorites, or whatever else, I'll be happy to respond in the comments. Wow, that is an awesome list! I have to admit, I am a little intimidated by your list, but way more inspired than intimidated. I am linking up with my list. While our list is not as extensive, it is exactly what fits our family, just as I am sure (and have seen from past posts) that your list of games is a wonderful fit for your family. Thanks for all the awesome info on each game! One of the default purposes of my daily notes is to provide lots of resources and options for other home educators. So since we have a pretty large stock of games, our list will be naturally pretty long (I wanted to be thorough). Never feel like it's a "showy" thing, or necessarily fancy... it's not. The purpose here is to share and evaluate, never to have or do more. To encourage and to give others ideas is my intent. Know what I mean? 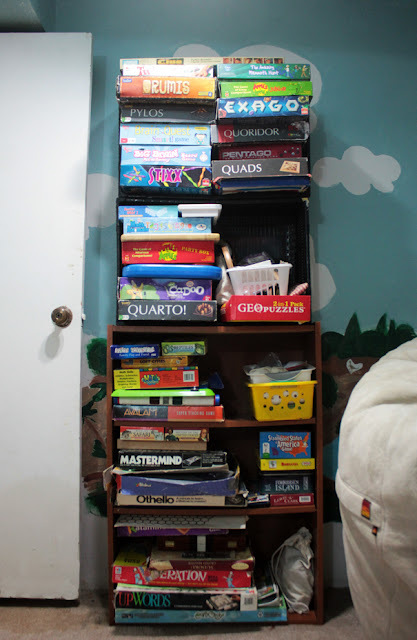 I love this post, especially your description of how you play games in your house. And I don't think you came off as arrogant at all! Love this post! All the games listed sounds just fab and I am sure that I'll be refering back to this list as the girls get older and are ready for more challenging games! Can't wait to get my hands on several of the ones you have listed for littles! They all sound totally like what we have been looking for! love your list :) we are game playing around here as well and i love to see what others have around so i check those out sometime :) thanks! what a great list. we have some of those. some of our favorites: connect four, blink and the orchard game. we could play those again and again and usually do. oh and mancala and we got this great one called Tell Tale and hedbanz. Oh! What a wonderful post! I'm so excited to see this fabulous list of games. It's resourceful and inspiring. Andria - I thought I published your comment, but it vanished! ?? Sorry! Jean - We have Set 'Cubed', which is set, only there are extra large dice instead of cards. :) I like it very much, but we haven't played it enough, yet, that the children are whizzes at it! Great post on games, Stephanie! I have been wanting to do a post like this forever. This will give me some extra motivation, and I'll be linking soon. I'm doing a game "class" at our local homeschool co-op. I'm amazed to find that a few of the kids really don't know how to think. I don't mean that particular games are difficult for them, but that they won't try - they can't do any of the games. They give up so easily. They sit and stare if I'm not directing them step by step. It just amazes me, and I wonder if their "school" is always just worksheets and the like. Some of the favorites in the class (because most of the kids are thinkers) are Amazing Mammoth, Pentago, Mastermind, and Gobblet. I am sorry if my comment made someone feel like I was judging- I was not. My initial thought was, "Wow, that is an awesome list!" followed by, "I hope that any mamas new to this way of life realize that an awesome collection like that takes a while to acquire." I meant no harm with my comment. I in no way feel that you are arrogant and I am truly sorry if it was taken that way. Oh, no, Tina... never think so!!! Really - you certainly did not offend, (Good Heavens!) and we're so good. It just seems a little ballsy sometimes to take on these sorts of posts, as if I am proclaiming that I know it all. (Which I hope I made clear in the "intro" to Tools... "Unschooling Tools" is totally a tongue-in-cheek thing, as I was just attempting to frame a few ideas for resources. For ideas, and encouragement. This is a great list. I always love other people's lists as it is such a great way to find new stuff. Wow! I'm bookmarking this one. So many games I see that I think the kids will enjoy, me too, of course. i'm loving discovering your blog! thanks for the work in the post.